Raised in the idyllic English countryside of the Lincolnshire Wolds, Catherine has grown up surrounded by life and nature; isolated from the burgeoning cities of man. It was not until her introduction to the Church of the Cycle did her place in the weave of life come to light. Displaying an aptitude for the teachings of their patron god, the young girl was soon taken notice of by the upper echelons of the church. A pact was forged and an unspeakable communion with their patron god was made. It was days before the first changes were noticed: the bloodshot eyes, the lack of want for food or water, the terrible temperament, the writhing of something under the skin. By the end of it she could blossom her power in a dramatic shift from human to a vessel of magical power. Once she had demonstrated control over her new flesh shaping biology they adorned her with their blessings and sent her on her way as a missionary of terror. Catherine is a flesh shaping magical girl. When in her magical girl form (the nun vestment aesthetic) she can warp and twist her biology to suit her needs; growing and shrinking as needed. She can project her mass twenty five feet in a sphere around her, and if needs be rupture parts of her off up to sixty foot, give or take. For example, shooting spines of bone at targets. In spite of her flesh shaping she can be slain with enough mundane force to obliterate her mass. Other mundane elements such as fire and ice also work. That being said, she has no 'weak spot', only brutish destruction will put her down for good. Catherine is grouchy and curt even to friends and associates. She has no patience for stupidity, much to her chagrin as she's been assigned to Elizabeth as a mentor for her visit to America, and to Void city. 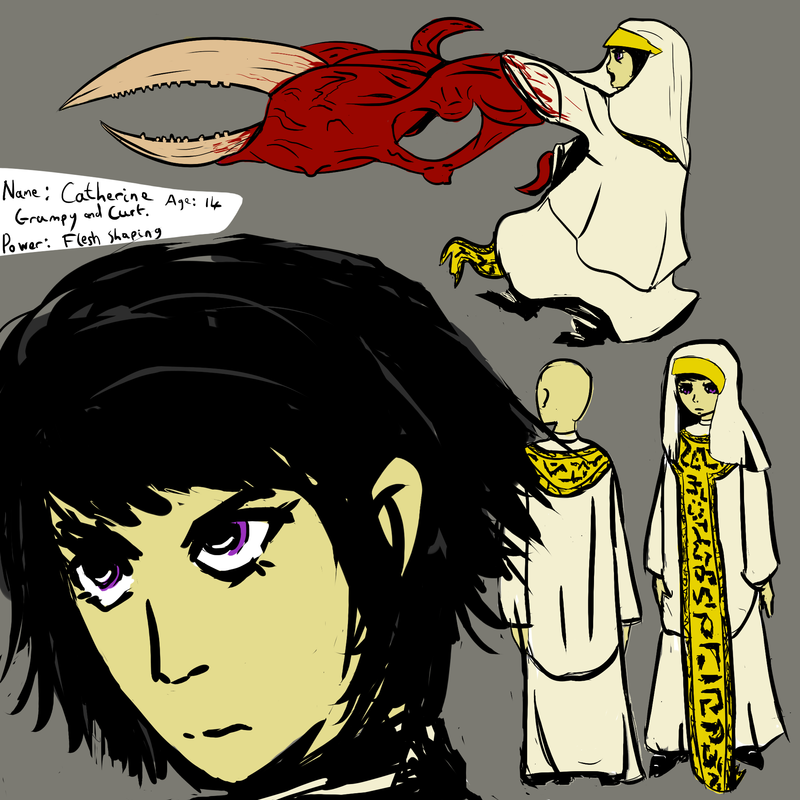 Catherine is a devout adherent to the Church of the Cycle and it's extremely unlikely she's going to be talked out of it; though her stubbornness and fiery nature can be used against her.